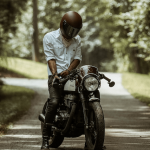 Motorcycle windscreens have properties that differ from other painted surfaces. There are a variety of cleaners and polishes for windscreens, but the best method for cleaning bug residue is with some basic automotive soap mixed with water.It’s not a good idea to rub any type of cleaner or polish on a dirty windscreen, unless specifically recommended by the manufacturer. Read the instructions carefully; most will recommend first cleaning the windscreen with a soap and water mixture, followed by a clean water rinse. 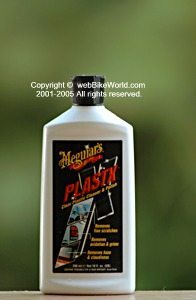 The Meguiar’s Plastx Clear Plastic Cleaner & Polish is a bluish gel that has a smell reminiscent of some type of household cleaner. It does an acceptable job of cleaning windscreens, but doesn’t seem to remove bug residue as well as some other cleaners.